﻿The Frozen Sing A Long Elsa doll is one of the must-have toys for Christmas 2015. Simply place the microphone up to Singalong Elsa to activate the hit song "Let It Go", which she sings in full. Elsa also lets your child join in; just take the microphone away, sing the song and she carries on where you left off. ​The Sing-a-long Elsa doll also says 15 different phrases from the film. You can join in at any time! Take the mic away and Elsa will give you the stage to sing "Let it Go"
Want this Frozen Elsa toy for Christmas? Buy it NOW! Every year there is a toy that is incredibly popular. There are plenty of stock in October and early November, but then supplies run low. Suddenly parents across the UK are trying to find the toy - and can't. Panic sets it! Last year, that toy was the Frozen Snow Glow Elsa, and we predict that the Singalong Elsa will be the top 'must have' Frozen toy this Christmas. 1. Delayed Imports. The current migrant situation is delaying imports from across the world, not just Europe. In past years, imports from China have been delayed with toys stuck in containers on the high seas. Add in potential port delays, and that means less toys available at the crucial buying part of the year. 2. Shortage of HGV drivers. There is a major shortage of HGV drivers in the UK this year. This will inevitably affect supplies getting from the ports to the stores, and movement of stock between online warehouses. Which means ordering popular toys online in mid December could be a dicey tactic indeed! And why buy now, apart from the delivery issues? Simple, you'll possibly pay less now. Inevitably, as toys go into shortage situations, the cheaper sources online and in-store run out of stock. Desperate parents turn to eBay and similar - and watch those prices rise as they do! So this year, as probably never before, our advice is "Buy early to avoid disappointment"! Is the Frozen Sing-A-Long Elsa Doll Worth Buying? The Elsa Sing-A-Long Doll will be a firm favourite in any household that is home to Frozen fans. Elsa performs the film version of Let It Go in full, and the sound is quite impressive. 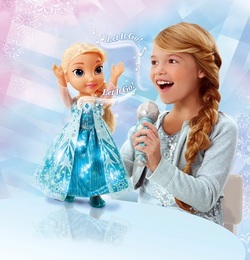 Children will be dazzled by the magic microphone that triggers Elsa to start singing. The real magic of the toy is in the microphone – by registering what part of the song that children are singing, Elsa can follow up with the next line. This duet synchronisation is a real treat for children. The microphone is also durable, and can withstand a few bumps and drops without damaging easily. The doll itself is well made. Elsa’s dress is sparkly and a good likeness for her iconic look. Similarly, Elsa’s face is instantly recognisable, which is always welcome in dolls of this style. The light up necklace and dress further adds to the magical feeling that children get when Elsa starts singing. Some parents reported having difficulty in getting the doll to work after replacing the batteries. Thankfully, this seems to be a reasonably isolated problem and is not reflective of most people’s experiences. Ultimately, for any child that loves Frozen and can’t get enough of Elsa, this sing-a-long toy is an ideal gift. Children will be entertained for long periods playing and singing with Elsa, and the main issue most parents will face is having to listen to Let It Go over and over again! Children younger than 3 might struggle to manipulate the microphone consistently in order to get Elsa to sing, but any children from 3 and up will have no such problems. In short, this is a good doll with a great gadget. 2 x AAA batteries for mic (not included).